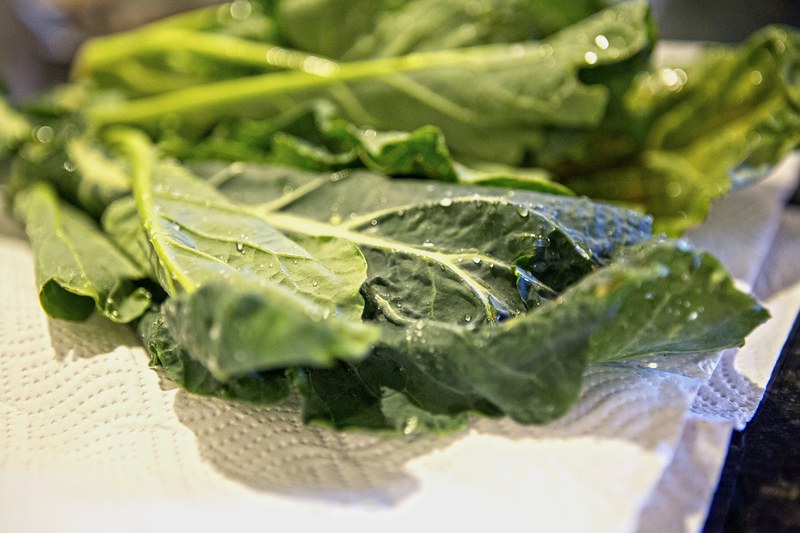 This makes winter the perfect time to use spinach or winter greens instead. For this recipe I used kale, but spinach or chard will both work well (I tend to go with what’s on sale.) It’s also a delicious way to get your greens in. 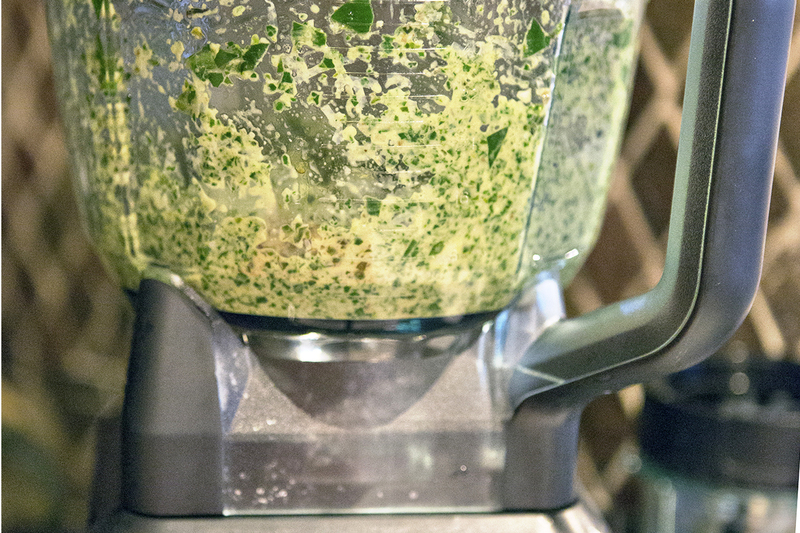 Do keep in mind that if you are using kale or chard (and even if you are using something fancy like a Ninja or Vitamix blender) the pesto will just not get quite as fine as a basil or spinach pesto due to the much higher content of fiber. For the protein, I used venison Italian sausage but you can use sautéed ground game as well, just depending on what you need to use up in your freezer. If you use plain ground meat, add a little fennel seed and/or an Italian seasoning blend when cooking it to add a little extra umph. You can of course omit the extra vegetables if you want to. I’m just one of those people that likes to cram veggies into everything I can. Bring a large pot of salted water to a boil. While waiting on that, get together a big bowl of ice water, big enough to hold all the kale. Add the kale to boiling water and cook until it becomes limp, about a minute or so. Remove with a slotted spoon and dunk immediately into a bowl of ice water. Drain and pat dry. Bring the large pot of water back to a boil and add the pasta to cook according to package directions. While waiting for the pasta to cook, add kale, pine nuts, garlic, olive oil, lemon juice and salt and pepper to taste to a food processor or blender and blend until smooth. If it's looking a little thick and dry, don't be shy; just add another glug or two of olive oil until the consistency is smooth. Heat a pan on medium and add the 1 T of olive oil. Add the onions with a little salt and pepper to taste and sauté until they become clear, about five minutes. Add the squash and red pepper and sauté just until they start to become tender, about five minutes. Add the sliced cooked sausages just to warm up. When the pasta is done cooking, save about 1/4-1/2 cup of the cooking liquid and drain. In a small bowl, mix the pesto with a little bit of the cooking water to help loosen it up. This is not a set amount, you just have to eyeball it, but this will help spread the pesto evenly and help it stick to the pasta. Combine the pasta, sauteed veggies, sausage, and pesto in a large bowl and toss until everything is evenly distributed. Serve with more grated cheese to garnish. Non-game substitution: Really any fresh sausage will do, as long as it’s not heavily seasoned in some distinctive way (chorizo wouldn’t be as good, for example). Vegetarian substitution: This one is a cinch for a veggie substitute – just leave out the meat and voila! A yummy vegetarian dish. To make it vegan, also omit the cheese from the pesto.